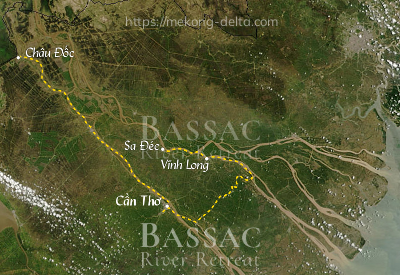 Enquire or book a trip along Châu Đốc - Cần Thơ - Vĩnh Long - Sa Đéc. Upon arrival at Vinh Long, transfer onto a local boat for a visit of the gardens and orchards of Binh Hoa Phuoc. Boarding back at noon, Refreshment as a welcome back.